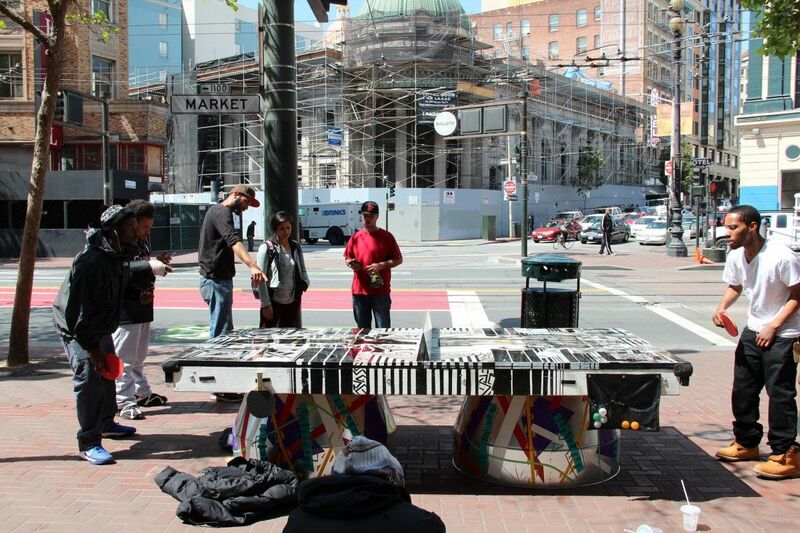 Last Thursday morning, a cohort of visiting government officials, nonprofit founders and advocates for the arts spilled onto San Francisco’s Market Street to discover a hexagonal ping-pong table. To their delight, the table doubled as a virtual jukebox, blasting a repertoire of AC/DC and Stevie Wonder songs as they picked up paddles and began to play. It didn’t take long for a knot of curious onlookers to form, with a few taking seats on wooden stools arrayed around the table. As players tired, they passed their paddles to the next person waiting, and so it went the rest of the day into the night. 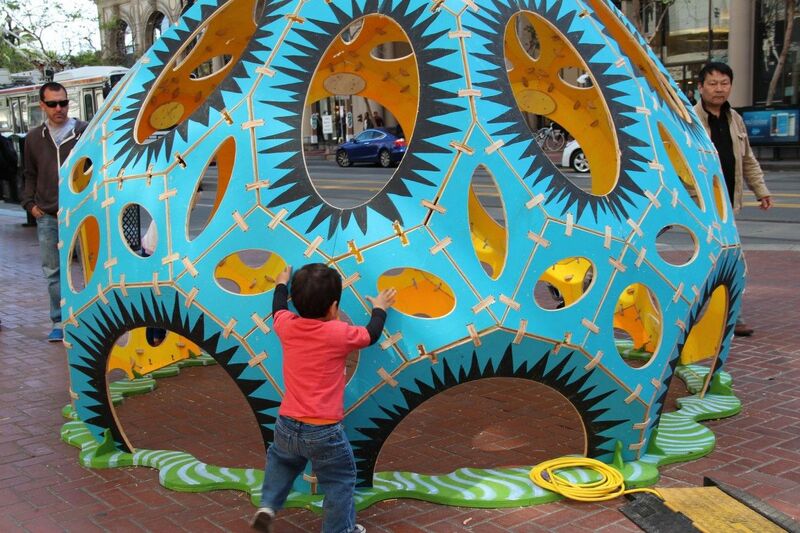 Arena/Play, as the installation was called, was one of the hits of last week’s Market Street Prototyping Festival, a three-day trial run of more than 50 projects vying to become permanent additions to the city’s most prominent thoroughfare ahead of its planned reconstruction in 2018. But the jury is literally still out on whether the table answered a deeper question: Does that passing of the paddle from one stranger to another represent the atomic building block of public space and public life — and if so, is it possible to capture these moments and manufacture more of them? Besides table tennis, there were other places to look. 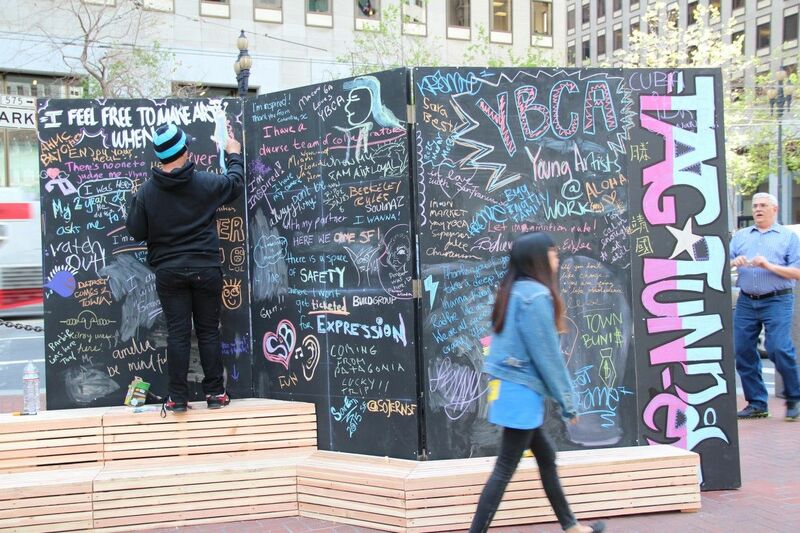 Farther along the two-mile stretch of Market Street hosting the festival, Street Sketch and Tag Tunnel offered passersby an opportunity to stop and draw in chalk. People danced and weaved in front of MeetWall, which used Kinect sensors to translate their movements into a wall of tiles rippling open and shut. Public performance was the theme of both Show Box and Market [Scene], where in both cases, pedestrians were invited to sit and take in the show, whether it happened to be a band or an unwitting performer handed a microphone and coaxed into singing along with Bruce Springsteen. The dream of transforming Market Street into San Francisco’s living room is at least as old as its previous overhaul in the 1970s to accommodate the Bay Area Rapid Transit system running along much of its length. 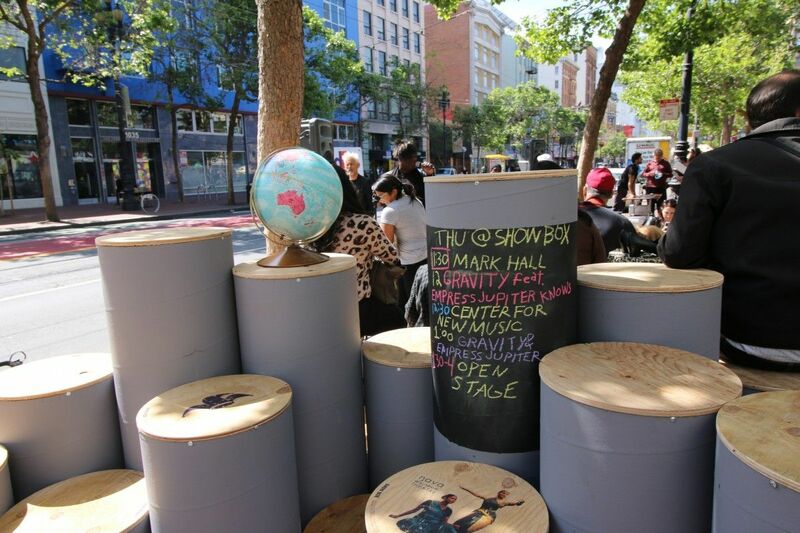 United Nations Plaza architect Lawrence Halprin had envisioned citizens playing in its fountains and basking on its marble benches — which were torn out along with Market Street’s when residents of the neighboring Tenderloin District took this desire to heart. On first glance, one of the more seemingly problematic prototypes appeared to be the Tenderloin ExerTrail, an outdoor fitness circuit aimed explicitly at the district’s 25,000 inhabitants, many of whom live in single-room-occupancy hotel rooms no larger than a jail cell. (Presumably, they have greater needs than a gym membership.) But any impressions that the ExerTrail was a flippant response to the festival’s theme of play were dispelled by speaking with its spandex-clad chief project designer, Cheyenne Purrington. Sixty percent of Tenderloin residents annually earning $5,000 or less are physically disabled, Purrington explained. “We know they want to get moving but can’t,” she explained. The ExerTrail was not only designed to offer exercises that could be done without equipment and without using one’s hands, but also with their needs in mind. Pointing to her office across Market Street at Community Housing Partnership — which works to provide housing and services to 1,500 formerly homeless residents — she described how gentrification was slowly eroding the streetscape so many Tenderloin residents relied on. “It’s very important to treat public space as an extension of their homes,” she said. Whether ping-pong or chalk art or impromptu karaoke is the best means for achieving this is one question deserving of critique. Demonstrating their effectiveness is another. The latter task falls to Gehl Studio, the San Francisco office of Copenhagen-based architect Jan Gehl, which has described at length in this Next City In Public column its efforts to refine and extend the observational techniques Gehl himself developed 50 years ago. To that end, the Gehl team deployed first-person observers, its Instagram-based social media analysis tool, and even, in a 21st-century homage to William H. Whyte, GoPro cameras mounted on several exhibits. Greg Lindsay is a contributing writer for Fast Company and co-author (with John D. Kasarda) of the international bestseller Aerotropolis: The Way We’ll Live Next. His writing has appeared in The New York Times, The Wall Street Journal, Bloomberg BusinessWeek, The Financial Times, McKinsey Quarterly, World Policy Journal, Time, Wired, New York, Travel + Leisure, Condé Nast Traveler and Departures. He was previously a contributing writer for Fortune and an editor-at-large for Advertising Age. Greg is a two-time Jeopardy! champion (and the only human to go undefeated against IBM’s Watson).